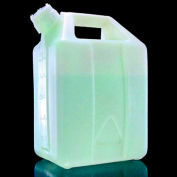 KIMAX® Wide Mouth Erlenmeyer Flasks are designed for ease in filling and have a heavy duty, tooled top for durability. 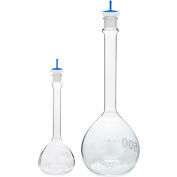 These wide mouth Erlenmeyer flasks all have durable white ceramic enamel scales to indicate approximate volumes at various levels, useful in measuring and mixing solutions where a high degree of accuracy is not necessary. Constructed of sturdy borosilicate glass. 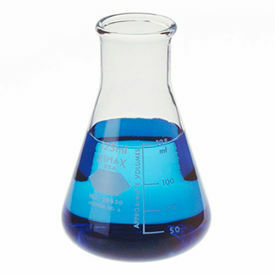 Designed from ASTM Specification E1404, Type I, Class 2 requirements: general purpose graduated glass conical (Erlenmeyer) flasks with wide mouth and heavy duty beaded top. 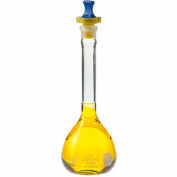 500ml Wide Mouth Erlenmeyer Flask with Heavy-Duty Tooled Top Finish & Capacity Scale Stopper No. 10, Grad. Interval (ml) 100 to 500, Approx. O.D. 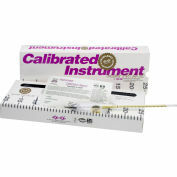 x Height (mm) 97 x 172, Case of 36.